Original cover by Herb Trimpe and Al Milgrom; Marvel 1979. Joseph Barrile's website is here. You can tell a LOT of love and sweat went into making this one. Kudos! Awesome! Great work, I love the style, perfect, bold lines. 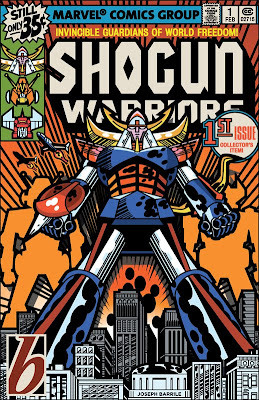 I'd love to see an animated Shogun Warrior done in this style. Some of the shading looks like Kirby Krackle. Love it! I especially like how you've taken Trimpe's art and re-done it in your own style. Anyway, love the bold lines on your cover...looks great! 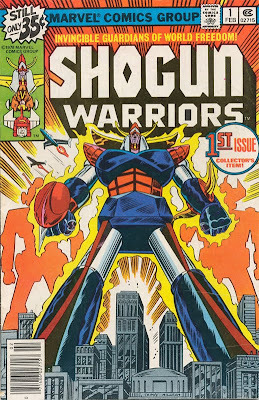 Very well done - Shogun Warriors are just one of my favorite things! I love how you added the "Kirby Krackle" and the dark, bold lines. Kuddos to you, sir! Thanks everyone; i hope you all enjoy it. It really was a work of love for me and I enjoyed every minute of illustrating it.